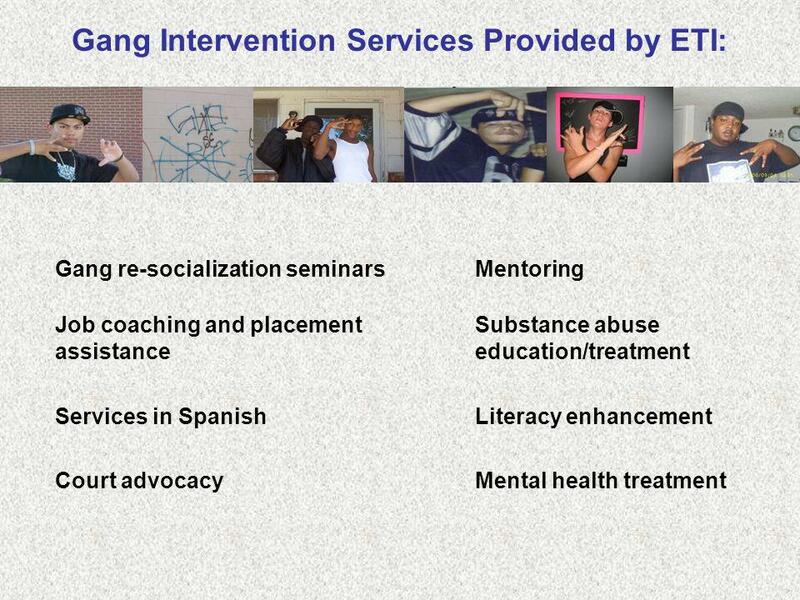 The ETI Gang Intervention Program Oklahoma County Presenter: Myron D. Mayberry, M.Ed. 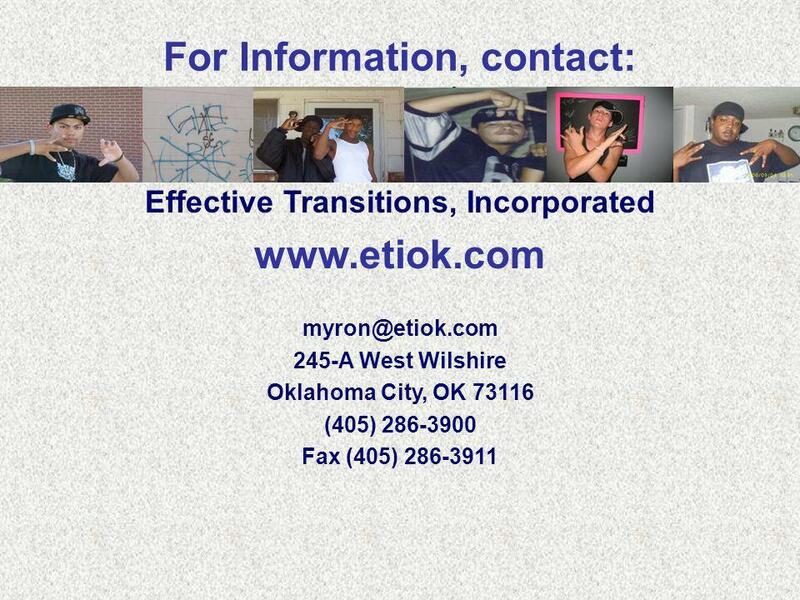 Effective Transitions, Inc. – Oklahoma City, OK.
4 What is the ETI Program? 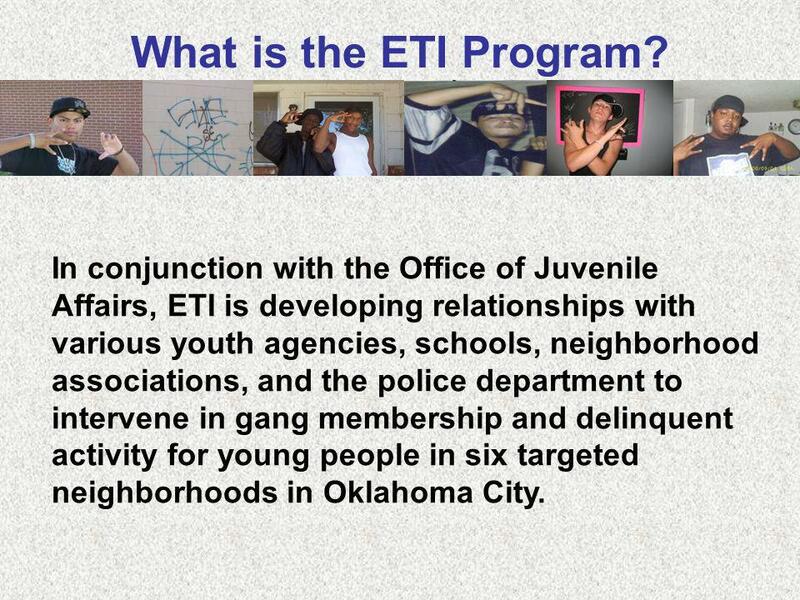 In conjunction with the Office of Juvenile Affairs, ETI is developing relationships with various youth agencies, schools, neighborhood associations, and the police department to intervene in gang membership and delinquent activity for young people in six targeted neighborhoods in Oklahoma City. 7 ETIs Annual Goals: GOAL ONE: Reduce the numbers of gang-involved Youthful Offenders involved in the Office of Juvenile Affairs that re-offend. 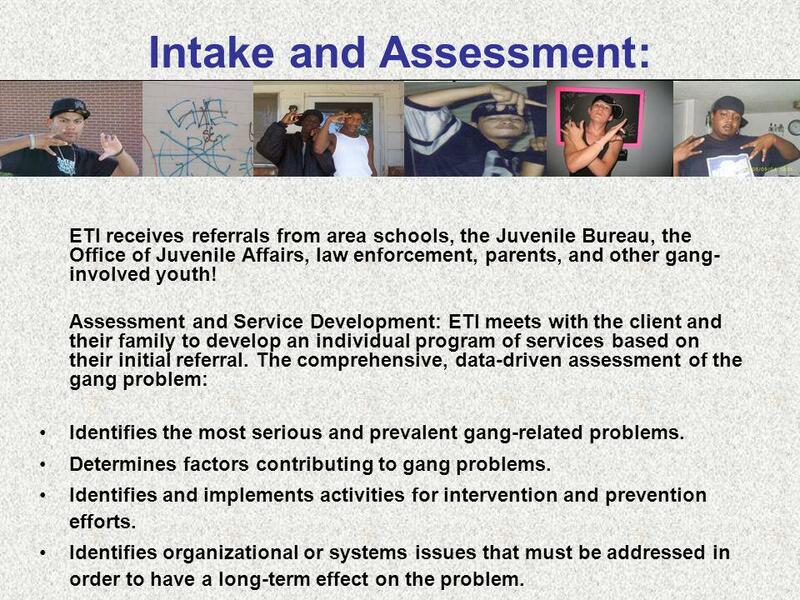 Objective One: Engage 25 Youthful Offenders in individualized gang suppression activities each 12 month time period. 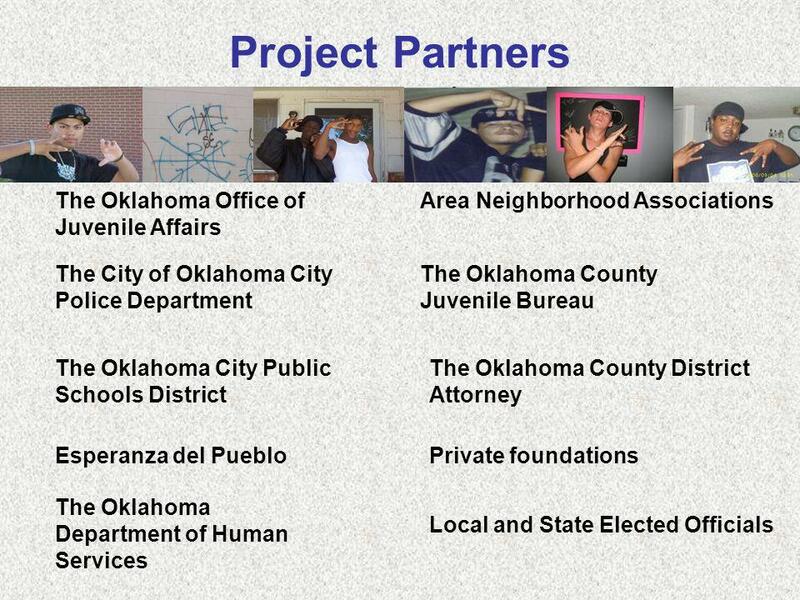 GOAL TWO: Reduce the numbers of gang-involved First and Second Time Offenders involved in the Oklahoma County Juvenile Bureau that re-offend. 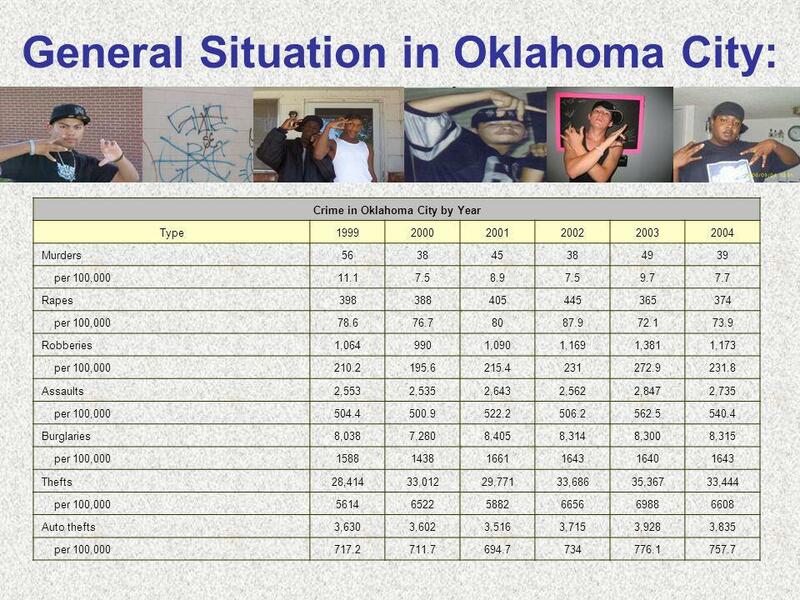 Objective One: Engage 75 gang-involved First and Second Time Offenders in individualized gang suppression activities each 12 month time period. 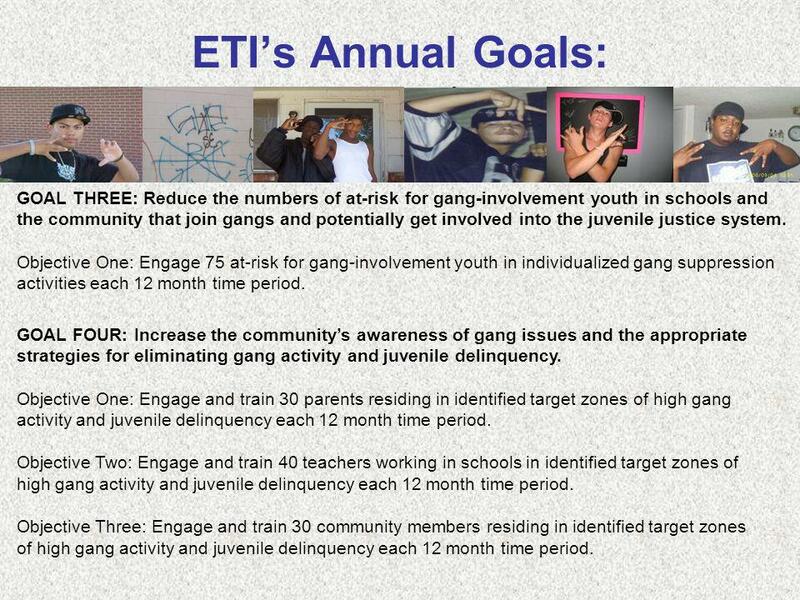 8 ETIs Annual Goals: GOAL THREE: Reduce the numbers of at-risk for gang-involvement youth in schools and the community that join gangs and potentially get involved into the juvenile justice system. 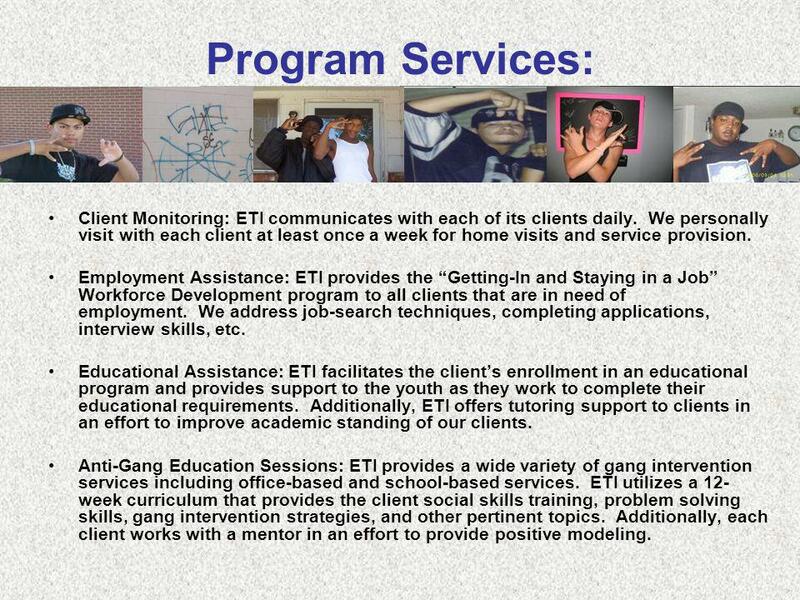 Objective One: Engage 75 at-risk for gang-involvement youth in individualized gang suppression activities each 12 month time period. 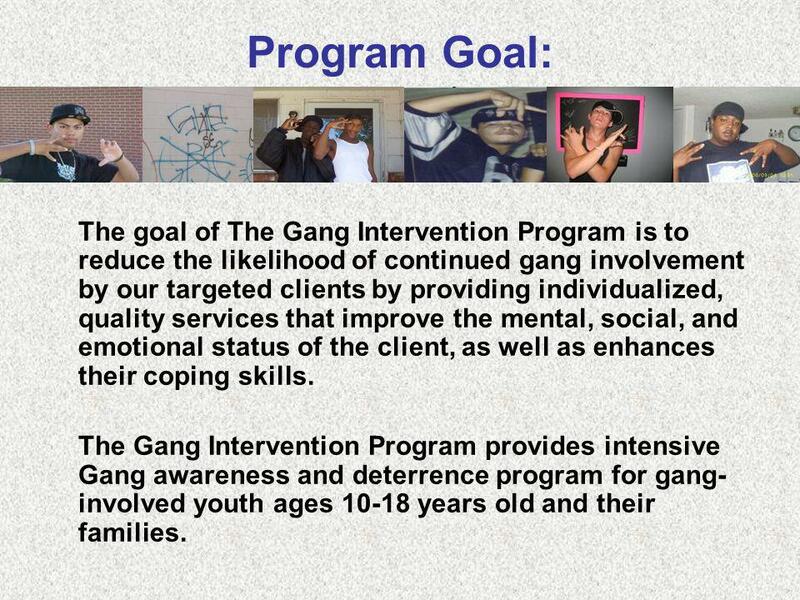 GOAL FOUR: Increase the communitys awareness of gang issues and the appropriate strategies for eliminating gang activity and juvenile delinquency. 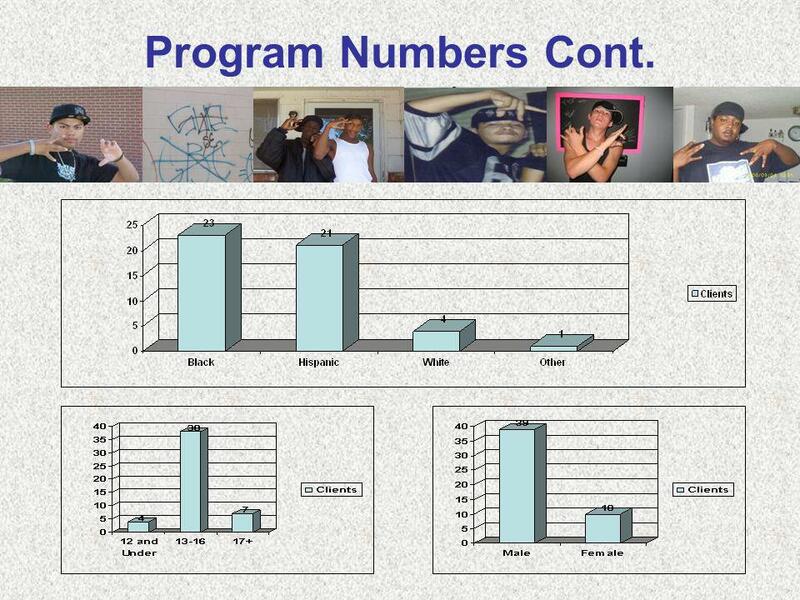 Objective One: Engage and train 30 parents residing in identified target zones of high gang activity and juvenile delinquency each 12 month time period. 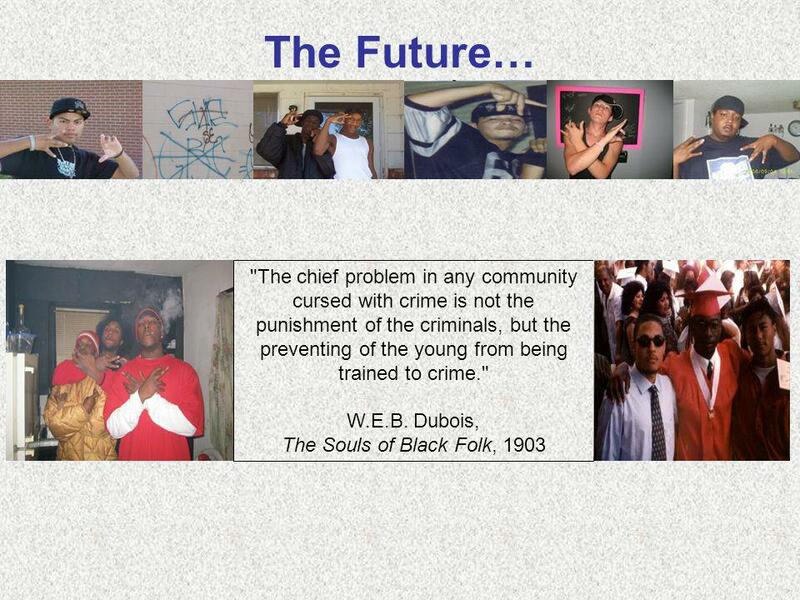 Objective Two: Engage and train 40 teachers working in schools in identified target zones of high gang activity and juvenile delinquency each 12 month time period. 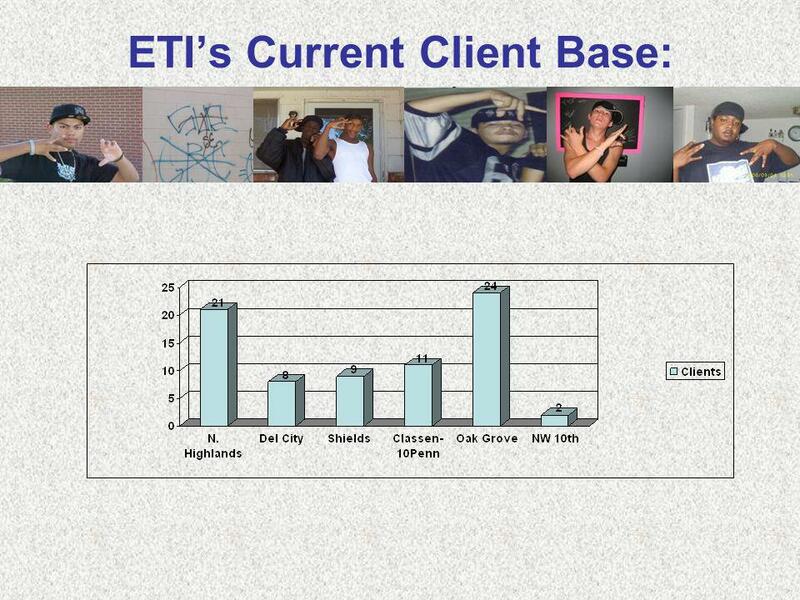 Objective Three: Engage and train 30 community members residing in identified target zones of high gang activity and juvenile delinquency each 12 month time period. 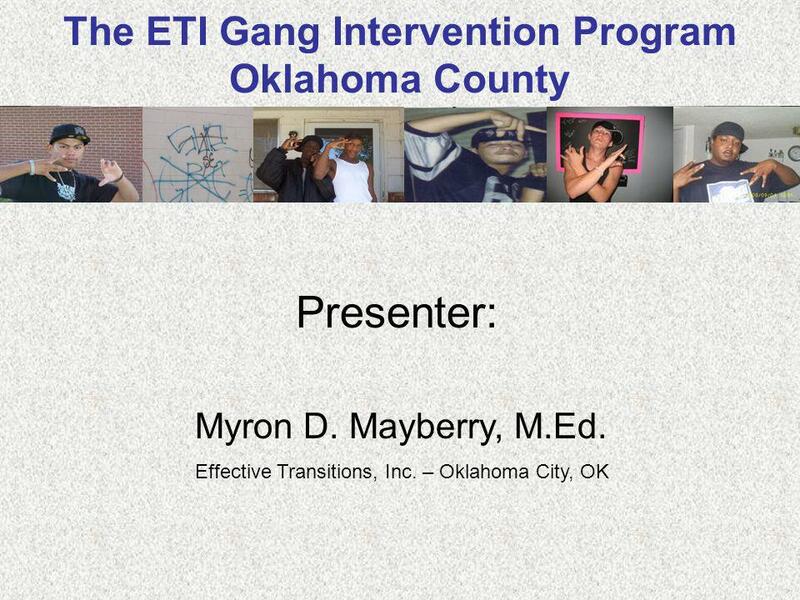 Download ppt "The ETI Gang Intervention Program Oklahoma County Presenter: Myron D. Mayberry, M.Ed. 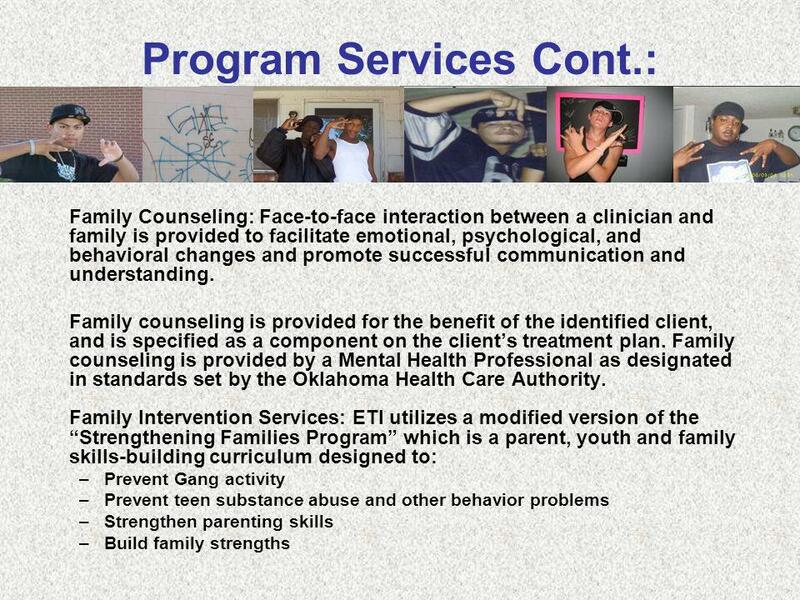 Effective Transitions, Inc. – Oklahoma City, OK."
Who We Are PACE Center for Girls: Practical Academic and Cultural Education. PACE provides girls and young women an opportunity for a better future through. The YVPC Fathers and Sons Program Cassandra L. Brooks, MSA Cleopatra Howard Caldwell, PhD and The Fathers and Sons Steering Committee Youth Violence Prevention. MISSION: To protect the public and reduce crime by and reduce crime by holding youth offenders accountable and holding youth offenders accountable and. 1 Department of Medical Assistance Services DD Waiver Provider Training Department of Medical Assistance Services Division. Baldwin County Sheriff’s Office Law Enforcement Exploring 1. 1. 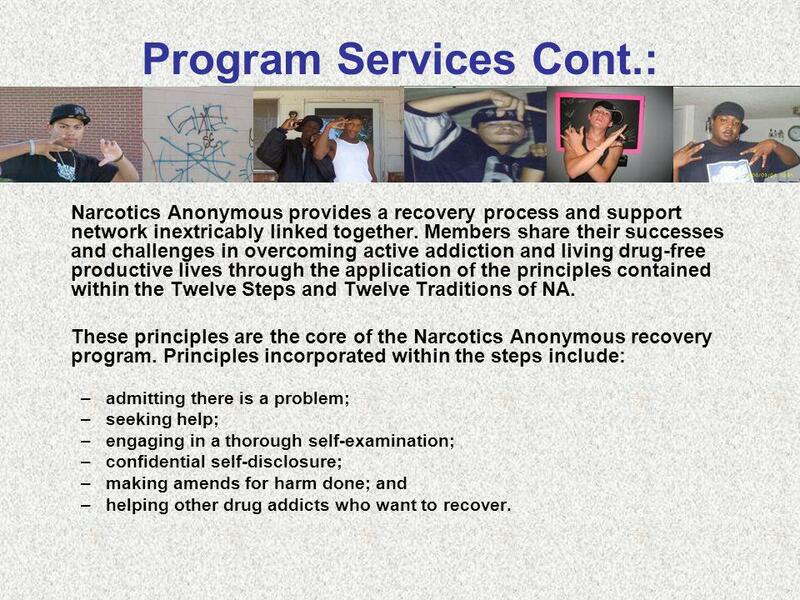 2 Purpose To assist schools to: implement appropriate prevention strategies to support young people at risk of drug related harm identify when a young. Parent Connectors: An Evidence-based Peer-to-Peer Support Program Albert J. Duchnowski, Ph.D. Krista Kutash, Ph.D. University of South Florida Federation. SCHOOL PSYCHOLOGY WEEK California Association of School Psychologists. Select Committee on Homelessness Hearing, The Road Home: Step Two Mental Health Systems Laura V. Otis-Miles, Ph.D., CPRP Vice President. What is the term that defines the men and women we supervise? Parolee Probationer Offender Supervised Releasee Restored Citizen Returning Citizen Client.